Bloomberg on Sunday, Jan. 30 cited a 28-page report--The Financial Crisis of 2015: An Avoidable History (pdf file below)--by Barrie Wilkinson, a London-based partner at consulting firm Oliver Wyman. The report describes a scenario--spanned 2013 to 2015--when Western QE-induced inflation brings down China, creating a debt crisis in the commodity sector--inclusive of resource-dependent countries as well as commodity producers--which eventually plunge the world into another recession, and a new world order by 2015. "...the dramatic rises in commodities prices resulting from loose Western monetary policies eventually caused rampant inflation in China. China was forced to raise interest rates and appreciate its currency to bring inflation under control." 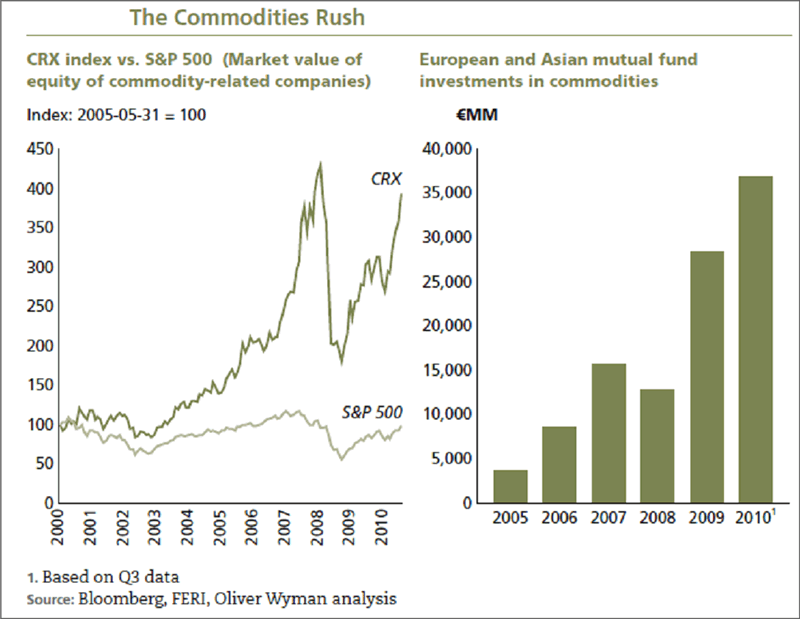 "Once the Chinese economy began to slow, investors quickly realized that the demand for commodities was unsustainable. Combined with the massive oversupply that had built up during the boom, this led to a collapse of commodities prices." Although I see this as low probability, but can't totally dismiss it. That is why global markets always sold off whenever there was news about China. "Having borrowed to finance expensive development projects, the commodities-rich countries in Latin America and Africa and some of the world’s leading mining companies were suddenly the focus of a new debt crisis.". The report describes that the new commodity debt crisis--in a sub-prime-like fashion--would hit banks and insurers via direct or indirect exposure, causing many to finally default. Without the emerging growth engine, the world would once again fall into recession. New World Order By 2015? 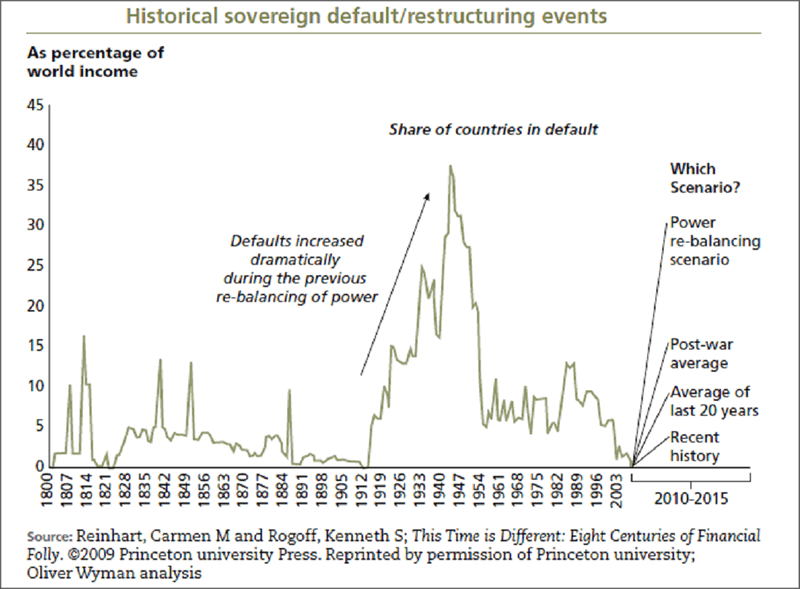 While I do agree that the sovereign debt is a great risk to another recession, and the scenario outlined by the report is quite plausible--when taking place in stages--most likely in the next decade or so, instead of by 2015. Furthermore, the scenario is based on the premise that China's inflation problem ultimately causes a new global recession by 2015; whereas the current inflation situation in China although quite alarming, is not yet out of control. From various indications so far, the Chinese central government seems to have committed to employ all necessary resources to rein in price bubbles, and I believe Beijing will most likely have it under control in the next two years. The growth rate may slow down to 8% range growth instead of the break-neck double-digit pace. So, commodities might cool as China tightens, but still well supported as China puts a floor on commodities. Nevertheless, since “observable fragilities in the global economy” do exist aplenty, a renewed crisis of any kind is all but too easy to erupt. So, I guess the world could eventually get to the "Judgement Day"--regardless how or when--if it holds the current course. The report calls this scenario “an avoidable history,” and urges regulators to address the financial market distortions, and that bankers should monitor risk levels and not take on excessive risks in pursuit of high returns of the days past. Bloomberg dubbed Wilkinson as "The Loneliest Man in Davos"...So, the jury is still out on that avoidable history.